Abraham (Hebrew אַבְרָהָם Avraham "Father/Leader of many," Arabic ابراهيم Ibrāhīm) was the original patriarch of Judaism, recognized as the "father of faith" by Christianity, and an extremely important prophet in Islam. The story of his life is told in the Book of Genesis and in the Qur'an. In both scriptures, Abraham is characterized as having exemplary faith, a living relationship with the personal God who directs his life. Judaism, Christianity, and Islam are sometimes referred to as the "Abrahamic religions" because of the role Abraham plays in their holy books and beliefs. The Hebrew Bible describes Abraham as the first patriarch of the Israelites. He is the one to whom God gave the blessing of descendants "like the sands of the sea" and the promise of a nation that would keep the ways and commandments of God. Abraham's journeys through the land of Canaan mark out the territory that would later become the land of Israel. In the Qur'an Abraham is a prophet blessed by God, and it is he who established the Ka'bah in Mecca as a holy sanctuary. His son Ishmael is said to be the father of the Arabs. Both Judaism and Islam credit Abraham with being the first monotheist, who, living amidst a polytheistic culture, had the revolutionary insight that there is but one God, the Creator of the universe. 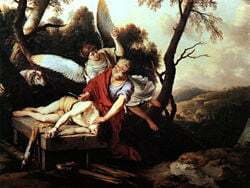 In Christian belief, Abraham is a model of faith, and his intention to obey God by offering up Isaac is seen as a foreshadowing of God's offering of his son, Jesus of Nazareth. His original name was Abram (אַבְרָם—Avram—"Exalted father/leader"), which was changed to Abraham in later life at God's command. The historicity of Abraham is debated by modern scholarship, and it is difficult to provide definite dates. Traditionally, he is said to have lived between 2166 and 1991 B.C.E. According to the Book of Genesis, Abram's father Terah came from Ur of the Chaldees. 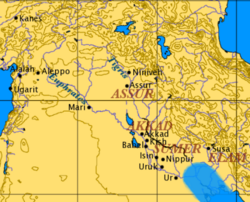 This is traditionally identified with an ancient city in southern Mesopotamia; however, Josephus, Islamic tradition and Maimonides each posit that Ur was in Northern Mesopotamia (identifying it with Urartu, Urfa, and Kutha respectively). Terah is said to have migrated with his family to Haran, apparently the classical Carrhae, on a branch of the Habor River. The Bible does not say anything of his early life. There is a story in the Midrash, that his father Terah owned a store that sold idols. As early as the age of three, Abram started to question their authenticity. This culminated in an incident when Abram destroyed some of these idols. He was then brought to the king, Nimrod, and he and his brother Haran were sentenced to death unless they recanted their position. Abram was then thrown into a fire. According to the Book of Jubilees, when Abram exited unscathed, his brother Haran also refused to recant, and was also thrown into the fire. However, because Haran did not truly believe, he died. The Qur'an confirms this tradition about Abram. His father (named Azar in Arabic) was an idol-maker, and Abram broke his idols, calling on his community to worship God instead. They then cast him into a fire, which miraculously failed to burn him (Q 37:83-98). Abram's confrontation with the idolaters suggests that it was in Mesopotamia that he first became a committed monotheist. According to the Qur'an, Abram enjoyed observing the heavens, and considered whether the stars, the moon and the sun could be gods. But since these all disappeared in the alternation of night and day, they could not be worthy of worship. He concluded that there must be one Lord who is the Creator of all these (Q 6:75-79). According to the Bible, one day God called Abram, "Go from your country... to the land I will show you" (Gen. 12:1). God promised to bless him and make him (though hitherto childless) "a great nation" (Gen. 12:2). One can surmise that it was not easy for Abram and his family to leave their settled life and journey to a strange land. As it says in the New Testament, "By faith Abraham obeyed when he was called to go out to a place which he was to receive as an inheritance; and he went out, not knowing where he was to god" (Heb. 11:8). He dutifully obeyed, taking with him his wife Sarai (later Sarah), his nephew Lot, and their household. Together they journeyed to the land of Canaan. Abram journeyed to Shechem, and at the sacred tree there received a new promise that the land would be given to his descendants. Having built an altar to commemorate God's appearance to him, he removed to a spot between Bethel and Ai, where he built another altar and called upon the name of Yahweh (Gen. 12:1-9). After this, he moved south, to the Negev. 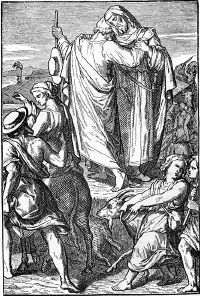 The Bible depicts Abram as a "sojourner" or "stranger" (Hebrew: gēr). Throughout his life, Abram journeyed from place to place, living the semi-nomadic life of a pastoralist who drove his herds of sheep and goats to where there was available pasture. He and pastoralists like him had a precarious relationship with the settlements and cities in the area: cities had markets where he could trade wool and skins, but they also could be hostile to these strangers in their midst. The stories of Abram's sojourning depict him as leading his family through many difficulties, living by his wits and his faith. For example, once he was driven by a famine to take refuge in Egypt (12:10). Abram feared lest his wife's beauty should arouse the evil designs of the Egyptians and thus endanger his own safety. He therefore instructed Sarai to act as his sister. The pharaoh then took her into the royal harem and showed his gratitude to Abram with gifts of herds and servants. Later, Yahweh "plagued Pharaoh and his house with great plagues." The king then realized that Sarai was Abram's wife and sent them from his land greatly enriched. In Genesis 20, Abram and Sarai again pose as brother and sister, this time in the Philistine city of Gerar. The storyline is quite similar to the episode in Egypt, leading some scholars to suppose a doublet of what was originally a single event. 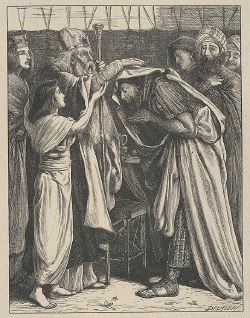 This time the king, Abimelech, is warned in a dream that Sarai is actually Abram's wife after God had caused the women of the city to cease bearing children. The text makes it clear that the king did not have sexual relations with Sarai. While the modern sensibility might criticize Abraham for endangering his wife on these occasions, the Bible recognizes the precariousness of his situation, which opens opportunities for God's grace. Abram then returned to the Negev, and wandered with his herds until settling again Bethel and Ai. There he stayed for several years, until strife arose between his herdsmen and those of Lot. Abram proposed to Lot that they should separate, and allowed his nephew the first choice of land. Lot preferred the fertile land lying east of the Jordan River, while Abram, after receiving another promise from Yahweh, stayed in the hilly terrain to the west. He moved south to the oaks of Mamre in Hebron and built yet another altar. Scholars believe the references to various altars established by the Patriarchs provide origin stories for later sacred altars used by the Israelites. Ironically, these altars were declared illegitimate by later biblical writers—a result of Hezekiah's reform in the eighth century, which established that sacrifices could only be offered at the Temple of Jerusalem. After about eight years, a war developed among the kings of the region's several cities. When Sodom fell, Lot was taken captive. Abram heard of Lot's ill-fortune and came to his rescue with a force of 318 armed men. He liberated Lot and the other captives from Sodom and recovered the spoils taken by Lot's captors. Melchizedek blesses Abram in the name of Elyon El, "God Most High"
After this victory, Abram received the thanks of the king of Sodom and was honored with a sacramental meal of bread and wine by the mysterious Melchizedek, king of Salem (Jerusalem), identified as a "priest of God Most High (El Elyon)." In exchange, Abram offered Melchizedek a tenth "of everything" (14:20). This event was the origin of the tithe in the Jewish and Christian tradition. Abram then received another revelation from Yahweh, who promised that his descendants will be as numerous as "the stars of heaven." Since he was childless, this seemed like an impossible hope, yet the Bible records that Abram responded faithfully: "He believed the Lord, and he reckoned it to him as righteousness" (Gen. 15:6). Saint Paul later quoted Abram's profession of faith (Rom. 4:3) as exemplary for Christians who live by faith, not by works. However, Abram balked when God told him that he would also take possession of the land of Canaan. "How can I know that I will gain possession of it?" he demands (Gen. 15:8). God instructed him to prepare a sacrifice of "a heifer, a goat and a ram, each three years old, along with a dove and a young pigeon" for a special covenant ceremony. In covenant ceremonies of this type, all the animals are cut in half and the parties to the covenant walk between the pieces (Gen. 15:17; Jer. 34:18). This prophesies that Abram's descendants would endure slavery in Egypt. Most exegetes regard it as a glimpse of a future already fore-ordained; however there is a hint that this future may have had something to do with Abram's failure to cut the birds and allowing "birds of prey"—a symbol of Satan—to pollute the sacrifice. As Sarai was infertile, she gave her Egyptian handmaid Hagar to Abram to bear a child in her stead. When Hagar became pregnant, she presumed upon her position to the extent that Sarai, unable to endure the reproach of barrenness, abused Hagar and forced her to flee (16:1-14). However an angel appeared to Hagar and commanded her to return and submit to Sarai, promising Hagar that her descendants will be too numerous to count. Her son Ishmael thus was Abram's firstborn. Abraham circumcised Ishmael on the same day that he circumcised Isaac (Gen. 17:23-27). After Sarai gave birth to Isaac, trouble arose when Hagar's son Ishmael, now a teenager, acted inappropriately toward the much younger Isaac at a feast held to celebrate Isaac's weaning. 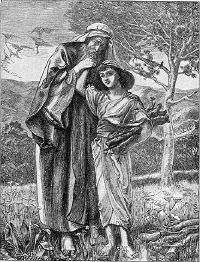 Fearful that the much older Ishmael would supplant Isaac as the son of the promise, Sarai demanded that Abram banish both Hagar and Ishmael, and God commanded him to follow her advice. The handmaid and her son were consequently exiled to the wilderness, where they nearly died of thirst before being rescued by God (Gen. 21:8-21). In the Islamic tradition, Abraham (Ibrahim) continues to have a close relationship with Ismail (Ishmael) throughout his life. Together, they traveled throughout Arabia, most notably to Mecca. There Ibrahim and his son Ismail reportedly rebuilt the Ka'bah, the sacred structure at the center of the Muslim pilgrimage, the hajj. In Genesis 18, Abram and Sarai provide hospitality for three visitors, who are traditionally regarded as angels, although one is addressed as "Yahweh"—God. Their promise of a son to Sarai made Abram "laugh," which would later figure in the naming of the son of promise, Isaac. Sarai herself also "laughed" at the idea (18:1-15). The following spring Sarai finally became pregnant; she gave birth to Isaac, which means "laughter" (Gen. 21:1-7). Genesis 17 describes the covenant of circumcision. Abram was promised not only many descendants, but descendants through Sarai specifically. God's covenant with Abram was to be fulfilled through Isaac, though God promised that Ishmael, too would be blessed to become a great nation. It was at this time that Abram's name was changed to Abraham and Sarai was given the name Sarah. In the biblical tradition, the line of succession runs from Abraham through Isaac to Jacob, the father of the Twelve Tribes. The God of the Israelites is therefore called the God of "Abraham, Isaac, and Jacob." In the Muslim view, God's promise runs from Abraham to Ishmael as the father of the Arab peoples, yet Islam also considers Isaac (Ishaq in Arabic) as a prophet. As the father of both Isaac and Ishmael, Abraham is ultimately the common ancestor of the Judaism, Christianity and Islam. Hence these are called the "Abrahamic religions." Isaac's son Esau is regarded as the father of the Edomites. Ishmael's 12 sons became prominent Arab princes. Moreover, Abraham's nephew Lot is portrayed as the father of the Moabites and Ammonites. Informed of God's plan to destroy the great city of Sodom, Abraham pleaded with God not to destroy the city, where Lot currently lived. God agreed that he would not destroy the city if there were 50 righteous people in it. Abraham bargained God down to 45, then 30, 20, even ten righteous people. Abraham's plea for Sodom and Gomorrah showed his compassionate heart of concern that innocent people not perish with the guilty. He bargained with God and even challenged him: "Shall not the Judge of all the earth do right?" 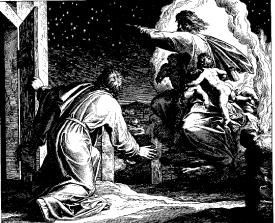 (Gen. 18:25). Judaism praises this level of intimacy with God, where a believer is not limited to accepting whatever God wills but may challenge God to do a greater thing. Unfortunately, not even ten righteous men were found. Although Lot and his daughters escaped, both Sodom and its sister city, Gomorrah, were obliterated. Instead of offering Isaac, Abraham then sacrificed a ram which he found on the spot. As a reward for his obedience he received another promise of a numerous seed and abundant prosperity. The offering of Isaac was certainly a difficult thing for Abraham, as the Bible hints when it calls Isaac "your only son, whom you love" (Gen. 22:2). According to the Jewish tradition, God "tested" Abraham with ten tests, the greatest being his willingness to sacrifice Isaac. At the same time, it was a test for Isaac, who was old enough to know what was going to happen to him. Several rabbinic stories describe Isaac's faith as equal to Abraham's; he even encouraged his broken-hearted father to be strong to carry out God's order. Traditionally, most Muslims believe that it was Ishmael rather than Isaac whom Abraham was told to sacrifice. In support of this, Muslims note that the text of Genesis, despite specifying Isaac, states that Abraham was told to sacrifice his "only son" to God. Since Isaac was Abraham's second son, Muslims believe that the original text must have named Ishmael rather than Isaac as the intended sacrifice. The Qur'an itself, however, does not specify that Ishmael was offered, saying only that it was his "only son" (Q 37:99-111). 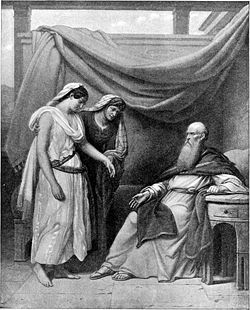 After Sarah's death, Abraham commissioned his servant Eleazar to find a wife for Isaac among Abraham's relatives in Haran. Eleazar returned with the lovely Rebekah, who turned out to be a perfect match for Isaac. "So she became his wife, and he loved her; and Isaac was comforted after his mother's death" (Gen. 24:67). Although a very old man, Abraham now took another wife for himself, Keturah. She bore him six sons, to whom he bequeathed lands while he still lived. These sons are traditionally believed to be the progenitors of several tribes living on the outskirts of Canaan, including the Midianites. The text also refers to other "concubines" who bore him sons. The Bible says that he sent them away to the "east country" (Gen. 25:6), from which derives a Jewish tradition that through them Abraham's wisdom was sown in the Eastern religions. Upon his death, "Abraham left everything he owned to Isaac." He reportedly died at the age of 175. Isaac and Ishmael were reunited for his funeral and buried him next to Sarah at the cave of Machpelah (Gen. 25:9). Abraham is considered the father of the Jewish nation, as its first patriarch, having fathered (Isaac), who in turn fathered Jacob, the father of the Twelve Tribes. God promised the land of Israel to Abraham's children, and this constituted the first claim of the Jews to Israel. Abraham was the first to know God personally and intimately, and through him God instituted many of the regulations for Jewish family life (Gen. 18:19), notably circumcision. Rabbinical tradition is rich with marvelous tales and spiritual insights about Abraham. God "tested" Abraham with ten tests, the greatest being his willingness to sacrifice Isaac. Jewish tradition ascribes a special trait to each patriarch. Abraham's was kindness. Because of this, Judaism considers kindness to be an inherent Jewish trait. In addition to describing Abraham's original insight into monotheism, rabbinic tradition teaches that God commissioned Abraham to spread the truth, even in Haran. He and Sarah made many converts, some of whom came with him to Canaan. Abraham also reportedly started a school for teaching his beliefs in God, and some say he wrote the Kabbalist work, the Sefer Yetzirah. Other works attributed to Abraham include the Apocalypse of Abraham and the Testament of Abraham, both of which are thought to date from the first century C.E. In the New Testament, Abraham is mentioned prominently as a man of faith. Jesus mentions him several times, as does the Epistle to the Hebrews; and the apostle Paul uses him as an example of true faith: "What does the Scripture say? 'Abraham believed God, and it was credited to him as righteousness'" (Rom. 4:3; Gal. 3). The Roman Catholic Church calls Abraham "our father in Faith," in the Eucharistic prayer, recited during mass. Abraham (called Ibrahim) is important to Islam, both in his own right as prophet and as the father of the prophet Ismail (Ishmael). Regarded as one of the most important prophets, he is commonly termed Khalil Ullah, “Friend of God.” While most Muslims believe that Adam was the first Muslim, they universally agree that Abraham was a model of faith in Allah. Many Muslims recite daily prayers that ask God to bless both Abraham and Muhammad. The direction in which Muslims face when praying is toward the Ka'bah, a structure Ibrahim reportedly rebuilt with his son Ismail in Mecca. In the Masjid al Haram in Mecca, there is an area known as the "station of Ibrahim" (Maqam Ibrahim; مقام), which is thought to bear an impression of Abraham's footprints. In the Qur'an, Abraham is the spiritual father of all believers, and the first to submit (islam) to God. He was the first monotheist (Q 6:76-83). As in Jewish belief, Abraham's father (named Azar in Islam) was an idol-maker, and Abraham broke his idols, calling on his community to worship God instead. They then cast him into a fire, which miraculously failed to burn him (Q 37:83-98). The well-known but non-canonical Qisas al-Anbiya (Ibn Kathir) records considerably more detail about his life, which is commonly referred to in Islamic accounts of his life. Traditionally, most Muslims believe that it was Ismail rather than Isaac whom Abraham was told to sacrifice. Muslims also note that nowhere in the Qur'an does God say that it was God who told Abraham to sacrifice his son. Many Muslims affirm that God would not order Abraham to commit what he prohibited—human sacrifice—even as a test. Abraham, however, thought the command—given in a dream—was from God. When the devil taunted them before sacrifice, Ibrahim and Ismail threw stones at the devil. This act is commemorated in the jumrah, one of rites of the hajj where the faithful throw stones at the symbol of the devil. It also symbolizes the rejection of evil ways in one's life. While denying that God directly commanded Ishmael's sacrifice, the entire episode is nevertheless regarded as a trial from God. It is celebrated by Muslims on the day of Eid ul-Adha. Abraham, as a man communicating with God, has inspired philosophers, especially the existentialists such as Søren Kierkegaard and Jean-Paul Sartre. Kierkegaard was particularly drawn to the issue of Abraham's offering of Isaac. God reportedly asks Abraham to sacrifice his only son. But does Abraham know that the voice he hears is really the voice of his God and not of someone else, or even the product of a mental condition? And even if it is God's voice, should such a command be obeyed? Kierkegaard concluded that God is to be obeyed and that such tests from God require a "leap of faith." Sartre, on the other hand, concluded that it is for us humans to decide how to interpret life's challenges. We stand alone in our freedom, fully responsible for our own actions, which is the core of existentialism. Theories abound concerning the "historical" Abraham as well as his legendary character and mythical significance. The discovery of the name Abi-ramu (Abram) on Babylonian contracts from about 2000 B.C.E. shows at least that the story of Abram's "Chaldean" origins is plausible. The fact that there were Amorites in Babylonia during the same period likewise is consistent with the idea of migrating bands moving from Babylon to Canaan. The Book of Genesis is widely believed to be based on a compilation of sources, which accounts for such phenomena as the doubling of certain stories (Sarah's entering the harem of the king of Egypt and later the king of Gerar, for example), the use of Yahweh for God's name in some passages and El, Elohim, El-Shaddai, etc. in others. Scholars postulate a northern source, "E" for the "Elohist" verses and a southern source, "J" for the Yahwist verses. Also evident is a priestly source, "P," that is particularly concerned with religious law and ritual, as well as a later Deuteronomic editor "D" who superimposed the religious view of the sixth century B.C.E. onto more primitive traditions. Some theorists suggest that Abraham was once a more localized tribal patriarch who later emerged as the larger-than-life central figure of the Israelite origin story. From the character of the literary evidence and the locale of the stories these scholars believe that he was primarily associated with Hebron and its environs. The story of the many widespread altars he reportedly established served to connect local religious shrines to the overall Israelite origin legend. ↑ According to the documentary hypothesis, several sources are woven together in this story. Abram calls upon God's true name only in the "J" verses of Genesis, while in the "E" verses he used the word Elohim, El-Shaddai, etc. to refer to God. ↑ Archaeologists believe the reference to Gerar as a Philistine city here is an anachronism, as the Philistines did not arrive in the area until much later. ↑ The binding of Isaac is one of the most challenging, and ethically troublesome, parts of the Bible. See Isaac for more details. ↑ A contemporary example of this phenomenon is the American tradition of "George Washington slept here" inns throughout the northeastern United States. Speaking of Faith: “Children of Abraham” – Transcript of interview with Bruce Feiler, February 8, 2007. This page was last modified on 23 March 2018, at 15:30.